This year, Italy’s Serie A adopted the English tradition of holding matches on the day after Christmas, known as Boxing Day, in hopes of showing off its domestic product to the widest possible set of eyeballs. Of course, as the hopefully embarrassed country came to realize, showing off the glories of Italian soccer all too often also means exposing the reprehensible aspects of Italian soccer, like its penchant for obscene fan violence and shockingly crass racism. This was the case during Serie A’s headlining Boxing Day matchup between Inter and Napoli. Things looked bad before the match even kicked off. In the lead-up to the game, bat-wielding Inter- and Inter-adjacent-supporting turds sought to beat on a collection of traveling Napoli fans for no discernible reason. In the mayhem, one member of the pack of ultras, Daniele Belardinelli, was hit by car. He later died from his injuries. In a separate fight between rival guys who love to take their shirts off and hang out with other shirtless dudes and sing songs together in praise of fit young men who excel at kicking a medium-sized ball around, four Napoli supporters were stabbed. Two Inter ultras have been arrested in relation to the stabbings. The madness had only begun there. 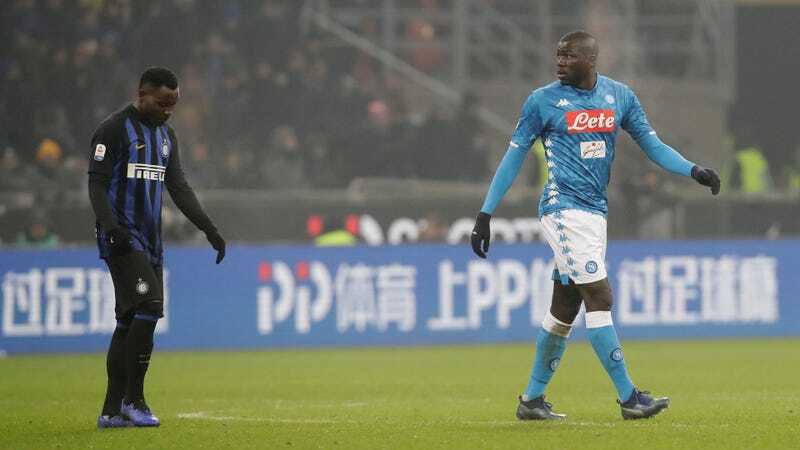 During the match, Napoli’s world-class central defender, Kalidou Koulibaly, was reportedly subject to nearly ceaseless racist taunts from the Inter crowd. Carlo Ancelotti, Napoli’s manager, said after the match that he requested that the match be suspended—as is protocol when a player or team makes the referees aware of fan-based racist attacks—on three separate occasions. Rather than halt the game, someone came over the stadium’s loudspeaker a couple times to kindly ask the fans to stop hurling racial epithets and making monkey noises at the Senegalese man they’d all paid to see play. Italian football federation president Gabriele Gravina said the racist chants and violence outside the stadium were “no longer tolerable”.